Chinese hot-pot (火锅, huǒ guō: fire pot) also known as Chinese fondue or steamboat, refers to the Chinese variation of the occidental stew: boil them all! 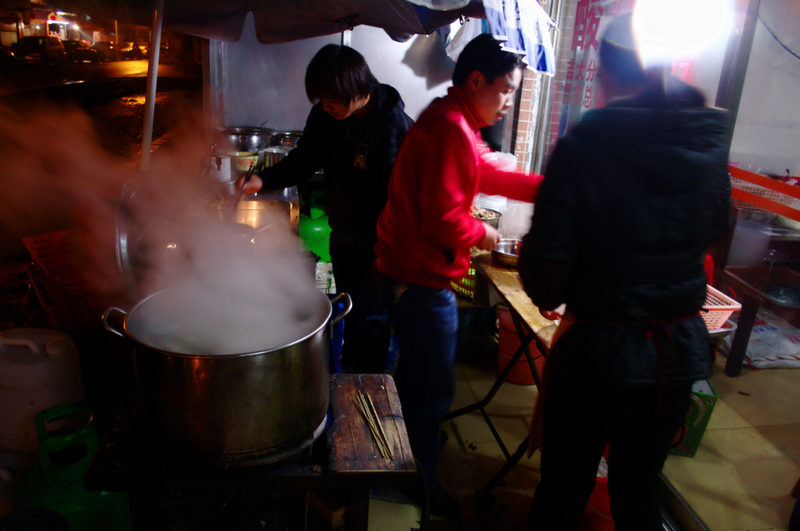 Near my apartment in Zhuhai, there is a shop offering a delicious hot-pot for 11 kuài until late night. Even getting back home at 4 a.m. you can get a warm soup of your choice to help you out with an empty stomach and a probable hangover next day! Around this shop, there are other small posts of barbecued vegetables and meat, and the usual thing to do after a night of heavy dancing and partying, is to get a piece from each one. You can have it to take away or eat it on the spot. Another takeaway food from Zhuhai: spiced tea eggs (茶葉蛋).